4.1 x 2.3 x 1.2 in. The Nikon Coolpix S8100 is based around a backside-illuminated CMOS image sensor with an effective resolution of 12.1 megapixels. BSI sensors place their circuitry on the reverse (non-light gathering) side of the image sensor, offering up more of the active side of the sensor for photodiode area, hence potentially increasing image sensitivity and reducing noise levels. The Nikon S8100's sensor is coupled with a Nikkor-branded 10x optical zoom lens which offers actual focal lengths ranging from 5.4 to 54.0mm, which equates to 30 to 300mm on a 35mm camera, a moderate wide-angle to a useful telephoto. In Macro mode, the Nikon S8100 can focus to just 0.4 inches. The Coolpix S8100 includes lens-based optical image stabilization, useful for fighting blur from camera shake. Images and movies are framed and reviewed on a 3.0-inch Clear Color LCD panel with anti-reflective coating and 921,600-dot resolution. The display is described by Nikon as offering a wide viewing angle, although no precise specification is available on this point. The Coolpix S8100 offers sensitivity ranging as high as ISO 3,200 equivalent. As well as still imaging, the Nikon S8100 offers Full HD (1080p; 1,920 x 1,280 pixel) movie recording with stereo audio. The Nikon S8100 stores images on Secure Digital cards. Connectivity includes an HDMI high-definition video output. Power comes from an EN-EL12 lithium-ion rechargeable battery, said to be good for 210 shots on a charge to CIPA standards. The Nikon Coolpix S8100 began shipping from late September 2010, priced at US$300. You've heard about the newest mega-zooms with their 36x lenses and others nipping at their heels with 35x and 30x zooms. Regardless whether you love or hate them, there's no getting away from the fact they are almost DSLR-like in size and weight. In other words, they're a commitment to carry. That's not the case with digicams like the Nikon Coolpix S8100, with its nice 10x zoom (30-300mm 35mm equivalent) and a body slightly more than an inch thick. There's no commitment here other than spending around $300 for the 12.1-megapixel CMOS camera. Let's see if this is one trip down the aisle we'd gladly make. Look and Feel. The Coolpix S8100 is a fairly good-looking camera, dressed in black, with a solid heft. It doesn't feel like your basic flimsy silver point-and-shoot--it has a nice, muted black surface--tipping the scales at 7.2 ounces (205g) with battery and card. Alas, the front has way too much white text surrounding the 10x extending zoom. Coupled with the various logos and icons, Nikon spoiled the overall look on the front fascia for me. Also on the front of the Nikon S8100 is a self-timer/AF Assist lamp and a slightly raised bar that--along with the textured thumb rest on the back--helps keep your fingers positioned properly. It doesn't have a large grip, but this wasn't a detriment in any way. The dominant feature on the back is a 3-inch LCD monitor with an outstanding 921,600-dot resolution. We tested the Nikon S8100 in all types of light and had no difficulties framing our subjects. Other controls on the rear are the ones you'd expect to see unless you've lived in a cave since President Reagan was in office. Standing out is the Record button, marked with a red dot for capturing videos (1,920x1,080 at 30 fps) on the top right next to the thumb rest. Below this is the Playback key and classic four-way controller with center OK button, which also serves as a mechanical scroll dial. The four directions give you access to Exposure compensation, Macro, Self-timer, and Flash settings. Below it are the Menu and Delete keys. As I said, as familiar as can be. On top of the Nikon S8100 is a pop-up flash, stereo mics, on/off button, and a mode dial that has reassuring clicks as you change options. The dial has rather limited choices as we'll detail shortly--just realize there are no PASM options; in fact major manual adjustments are nowhere to be found on this camera beyond EV, white balance, and ISO. Next to the dial is the shutter button surrounded by a zoom toggle. One nitpick: the on/off button is very small, indented, and tough to press. The left side is plain other than a 4-pinhole speaker. On the right side is a plastic door for the mini HDMI output and an eyelet for the supplied wrist strap. The flexible plastic door has two hinges and I'd avoid yanking on it in order to prevent a trip to the service center. Surprisingly, the combo A/V-USB out is on the bottom of the Nikon S8100, next to the compartment that holds the battery and SD/SDHC/SDXC card; the Made-in-Indonesia camera is not compatible with MultiMedia Cards, but that's not such big deal in 2011 with the plummeting prices of SD media. The camera measures 4.1 x 2.3 x 1.2 (104 x 59 x 30mm). This is a solid, easy-to-hold camera you'll have no problems carrying around at all times. Lens. Within the Nikon S8100's 1.2-inch deep body is an extending 10x Nikkor ED glass optical zoom lens. It has a range of 30-300mm so you can capture decent wide-angle landscapes and family portraits as well as zooming in on specific subjects in the distance. Personally I prefer a wider opening focal length (26mm or 28mm) but you can't have everything. The lens has a maximum aperture range of f/3.5-5.6 with 10 elements in 8 groups and a 2-step ND filter. Macro gets as close as 0.4 inches (1cm). Even though the Nikon S8100 has "only" a 300mm telephoto, not the 820mm of some mega-zooms, image stabilization is still very important, as every jitter will be magnified at the longest focal length. Nikon employs 4-way VR (Vibration Reduction) including optical image stabilization. It also boosts ISO to 3,200 in certain instances. I was impressed with the 5-way VR of the Coolpix P100. We'll see how this system performs shortly. Controls. Since this is a point-and-shoot, not a DSLR or even an advanced digicam like the Coolpix P7000, controls are very basic, typical of an aim-and-forget digicam. Remember, the Nikon S8100 has very few manual adjustments other than exposure compensation, white balance, ISO, vividness, and hue--forget manual focus or changing apertures and shutter speeds. These are handled automatically when you choose a specific Scene mode. Your main control is the Zoom toggle switch surrounding the shutter button. It moves through the 10x range very quickly with no "hitching." Modes. This is clearly a point-and-shoot, but even though it doesn't have the tweakability enthusiasts desire, it does have some different options on the Mode dial. There are the standards such as Auto, Continuous, Scene, Scene Auto Selector and Subject Tracking. On the more unusual front, the dial gives you quick access to Night Landscape, Night Portrait and Backlighting, modes relegated to the menu system in the Coolpix P100 I tested last year. These options capture a series of shots, which are combined in camera for improved quality. In Backlighting mode you can enable HDR, which combines frames for a more even exposure in difficult lighting situations. It's off in the default mode, but Nikon should definitely enable it from the outset. You'll know why as you read on. The Continuous mode offers more than the usual burst options. It has Continuous H, L, pre-shooting cache, Sports Continuous, Nikon's Best Shot Selector, and Multi-shot 16. H gives you 10 frames per second, L is 26 frames at 1.8 fps while the pre-shooting cache saves up to two frames before you press the shutter completely down (up to 5 frames total at up to 5 fps). Sports Continuous grabs up to 54 frames at 1/120th of second, but they're 1-megapixel images. Multi-shot 16 takes 16 2-megapixel stills at 30 fps. 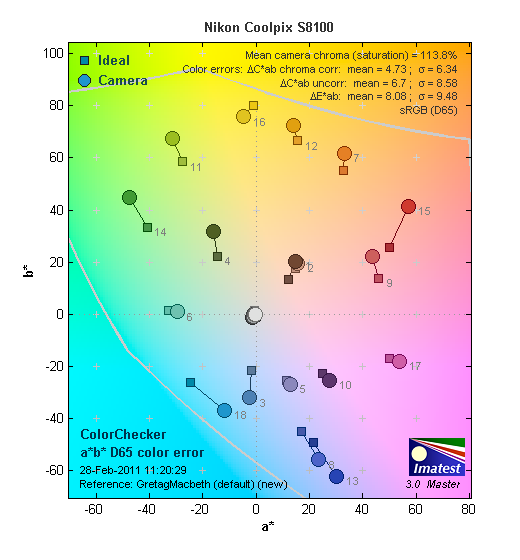 As we said, the Nikon Coolpix S8100 has plenty of options, but the results are far from DSLR-like. With Scene mode you have access to 13 of the usual choices ranging from Portrait to Food. Scene Auto Selector is similar to intelligent auto found on other digicams. Here the Nikon S8100 guesses the scene in front of it makes the appropriate adjustments; it chooses among seven options and does a good job of guessing correctly. Subject Tracking lets you designate a key subject such as a child and the focus area moves along with that person or thing when you keep it in the view screen. Since this is 2011, HD video is a given for a quality digicam. With the Nikon S8100 you can record Full HD 1,920 x 1,080 videos at 30 fps; it uses the MPEG-4 AVC H.264 codec (MOV format). This is not the best available for a digicam--select Sonys and Panasonics shoot AVCHD 1080i at 60 fps. This setting is much better, but keep in mind that new camcorders on the market shoot 1080/60p, some of the best-looking video I've shot to date. Menus. We're in the iPad era, and Nikon's linear menus seem decidedly 20th Century. There's nothing wrong going back to the good old days, but don't expect to be wowed by Nikon's GUI. You'll have no problems using it, however. When you hit the Nikon S8100's Menu button--depending on the mode you're in--you'll have access to adjustable parameters. You press Menu then use the four-way controller to step through the choices. In Scene Auto Selector, for example, it's just resolution. And since this is a fairly basic camera, Nikon offers only one compression option at best quality. In Auto you can access white balance, ISO, and a few others. Storage and Battery. The Coolpix S8100 uses SD, SDHC, and SDXC cards but not MMC in any form. Since Full HD video is an important feature, at least a Class 6 high-speed card should be used; 4 or 8GB will do the trick. The S8100 also includes 102MB of built-in memory. The Nikon S8100 is supplied with an EN-EL12 lithium-ion battery. Per CIPA standards it lasts for 210 shots in still mode. Even though I got more than that during my tests, this is below average, so a spare makes good sense for anyone planning on spending a long day in the field. Speaking of the battery, Nikon does not supply a dedicated charger. You connect the camera to an AC adapter via the supplied USB cable. In other words you have to charge the battery in-camera so your new baby is out of commission until it's re-juiced. The plus side is that you can charge the battery via your computer's USB port, so long as you've brought along the Nikon S8100's USB cable. Playback. Your playback options for the Coolpix S8100 are fairly standard. Hit the Playback key and you can walk individually through images using left/right arrows or the wheel on the controller. The zoom toggle lets you enlarge photos 10x. Push the toggle left and you'll see different size thumbnails as well as a calendar view. Again it's very straightforward with no swipes or taps. In Playback you have access to Nikon's editing options which include Quick Retouch, D-Lighting, and Skin Softening. They're good little add-ons but certainly won't replace Photoshop or Lightroom. Bears and photographers start stirring when the weather warms up from the dead of winter. What better place to go than the beach in the Northeast to get a taste of summer? Actually I could think of many toastier climes, but New York's Coney Island, a faded seaside resort with some good photo opportunities, was on the top of my list. I also had the Nikon S8100 with me for various trips into Manhattan. One of the great things about this camera is the simple fact you can easily tote it around without the bulk of a full-blown DSLR rig. ISO 3,200. Though it took three tries to get the focus right in low light using Auto, this shot of a slumbering feline prints pretty nicely at 8x10, with surprisingly good detail in the hair at ISO 3,200! Before getting into the results, let me report the Nikon S8100 does the trick as a point-and-shoot. Just take it out of your pocket, turn it on and fire away, as it's quite responsive and rarely grabs for focus. On the down side, I kept fumbling with the Power button, as it's really tiny and placed a little too far left on the Nikon S8100's top deck. As noted, the camera travels the zoom range smoothly, and at 10x the time it takes from 30-300mm is rather quick. The LCD screen is a winner. Although it's fixed, not vari-angle, I had no complaints even shooting in direct sunlight. The menus are simple and it's doubtful most will even load the User's Manual disc in their computers to get up and running. Possibly that Reagan-era shutterbug who just woke up might need it, but that's about it. I did all of my shooting at the 4,000 x 3,000-pixel Fine setting, starting in Auto then Scene Auto Selector then exploring the other Mode dial options. Once home, I downloaded everything to a PC, made full-bleed 8x10 prints with no post-processing and watched the videos on a 50-inch plasma HDTV via HDMI. And now for the $300 question. Wide and Tele. Though there's some optical distortion on the parachute ride at wide-angle, the Nikon S8100 does a great job at telephoto. Note that in the wide-angle shot, the difficulty couldn't be more pronounced, with fine red detail against a blue sky, so we think the S8100 did pretty well considering. At first I wasn't completely satisfied with the images captured by the Nikon S8100. The Pollyanna in me always gives the benefit of the doubt to every camera even point-and-shoots with 1/2.3-inch sensors. And that's good, because over time I came to appreciate images from the Nikon S8100. But I'm getting ahead of myself. Like any decent camera, the Nikon S8100 delivers very good photos when there's enough light, be it a sunny day by the beach or shooting orchids in a sunlit window. 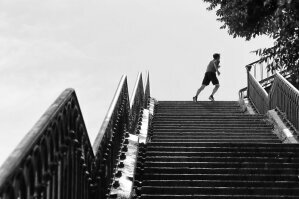 When I began my photo safari in Coney Island, great scenes immediately presented themselves. These included colorful steel superstructures of rides under construction, the world-famous red parachute jump, over-the-top street signs and, of course, the ocean nearby reflecting the sunshine. While shooting in Auto under these conditions the camera typically used ISO 160 (the best setting) and the results onscreen and my 8x10 prints were top notch. You'd have to be super picky to find any issues with them. Colors were very accurate, not quite as vivid as those from a Canon PowerShot but still very good. This was confirmed by our lab as at ISO 160 and 200 prints look good at 16x20, but a tad sharper at 13x19 inches. The Beekman Tower. Capturing the ripples on Gehry's vision was easy for the Nikon Coolpix S8100. Although not a mega-zoom, the Nikon S8100's 10x zoom is a good one--especially the fact the body is only slightly more than an inch thick. I enjoyed having the 30-300mm focal range at my fingertips. Although it's not my preferred 26-28mm, the 30mm setting provides a bit of good perspective distortion (not geometric distortion) which is a true positive with architectural images such as a Gehry building in Manhattan or the parachute jump in Coney Island. The results were good shooting a wide view of a fake palm tree on the beach and then zooming in to a person on the pier I could barely see. There's something to be said for a potent telephoto you can easily carry around. I did notice some purple fringing at extreme telephoto, but although noticeable at 100% blowups on the monitor, it was negligible in my prints. In the lab results, corners are soft at wide-angle, but only in the very far corners. Tele corners look good. Chromatic aberration is high at wide-angle, reaching far into the frame but it's worse on the left side. C.A. is moderate at telephoto, but it also extends far into the frame. There's very slight barrel distortion at wide-angle and telephoto. Night Landscape. Captured at 300mm, it's not a surprise this shot is a little soft, but it was shot handheld at 1/30 second. Night Landscape is a Scene Mode Nikon took out of the chorus and put out front on the Mode dial. I used this often in Manhattan, shooting various lighted buildings at night, of course. Results of these handheld shots were mixed as the 4-way VR didn't deliver rock solid images compared the 5-way system of the Coolpix P100. Sometimes a monopod is the only answer for shots of this type. One of my favorite features on the camera is Backlight HDR, another Scene Mode Nikon put up front on the Mode dial. Although the camera takes a breather for about 15-20 seconds as it processes and saves multiple frames to the card, the results are well worth it. Granted it's for static subjects, but the setting does wonders for your photos, improving the overall tone and enhancing subjects in shadows. It's very cool. I'm not saying you should buy this digicam just for this option, but the results are terrific with accurate exposures in oddly-lit situations. Continuous. Not much was moving quickly in my travels--everyone's still thawing out--but a flock of fleeing seagulls gave the camera a chance to use Continuous H. The results were OK, nothing more. My hat goes off to those SI photographers who freeze peak-performing athletes in action. The fact they use $10,000 DSLRs that grab 8 frames per second and not $299 digicams might also have something to do with their outstanding results. Don't expect anything like it with the Nikon S8100. Shutter lag. On a brighter note, the Coolpix S8100 is a responsive camera. Per our lab tests shutter lag is very fast: 0.177s wide, 0.179s tele; prefocused 0.071s. Cycle time is 1.4 seconds per shot (0.71 fps) while the flash recycle is 5.4 seconds. I also took some macro images of flowers and a candle flame and my real-world results were quite good. The lab showed the camera had a very close macro but like most, it softens quickly radiating out from the center. You'll like the results as I did. Movies. Full HD quality was reasonable for a long zoom point and shoot, but not equal to a dedicated camcorder. You can zoom in and out optically while recording, a major bonus. Click the image to download the full-res MOV file (It's a large Full HD file, 67MB, be sure your computer can play it). Movie mode. Although the Nikon Coolpix S8100 handles well-lit photos quite well, it's less successful with movies. The 1,920 x 1,080 videos at 30 fps are better than years past, but they just don't have the richness of a quality AVCHD model shooting at 24 Mbps--forget the newest editions capturing 1080/60p which is 28 Mbps. Remember this is a $299 digicam that shoots HD videos, not a similarly-priced camcorder whose reason for being is movie recording. That caveat on the table, colors were on the money, the optical zoom is available and the stereo sound is a bonus. The tiny mics magnify wind noise, so be prepared for a soundtrack that puts you on an airport runway with just a slight breeze. Overall, the Nikon Coolpix S8100 performed its assigned duties well outdoors, and occasionally impressed indoors and at night. It's easy to expect too much from a pocket long zoom, but we think the Nikon S8100 will serve very well for most casual photographers. Sharpness: The wide-angle end of the Nikon Coolpix S8100's zoom shows very strong blurring in the corners of the frame compared to what we see in the center, though blurring doesn't extend very far into the image area. At telephoto, blurring in the corners isn't much stronger than at center. Geometric Distortion: There is surprisingly little distortion at wide-angle and full telephoto (only about 0.1% barrel distortion in both cases). The Coolpix S8100's processor is thus up to the task of correcting for geometric distortion. Chromatic Aberration: Chromatic aberration at wide-angle is high in terms of pixel count, and pixels are a very bright purplish-blue. A telephoto, the distortion is again somewhat high, with bright reddish pixels dominating the outer edges, while slightly milder greenish-blue pixels are visible opposite. Macro: The Nikon Coolpix S8100's Macro mode captures good detail at the center of the frame, though both blurring and strong chromatic aberration encroach far into the image area (a common limitation among consumer digital cameras in Macro mode). Minimum coverage area is 0.98 x 0.73 inches (25 x 19mm), which is quite good. The camera focuses so closely that the flash is blocked by the lens in the majority of the frame, and overcompensates by blowing out the top left corner. 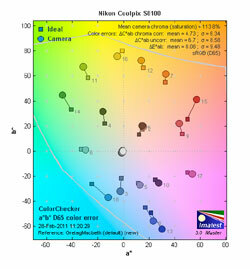 Viewfinder Accuracy: The Nikon Coolpix S8100's LCD monitor showed about 98% coverage accuracy at wide-angle, and about 99% at telephoto, both of which are good. Color: Overall color is good, though strong reds, greens and blues are pumped a little high, and bright yellows are actually slightly muted. (This is fairly common among consumer digital cameras, however.) Hue is a little off for colors like red, some pinks and cyan. Dark skintones are strongly pushed toward orange, while lighter skin tones are almost dead-on. About average results overall, though. Incandescent: Both the Manual and Incandescent white balance settings performed fairly well here, though the Incandescent image is a hint too warm and the Manual setting a little cool. Auto erred on the side of too much red. Depending on personal preference, Incandescent or Manual will do. Resolution: Our laboratory resolution chart revealed sharp, distinct line patterns down to about 2,000 lines per picture height horizontally, and to about 1,900 vertically. 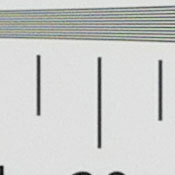 (Lines are distinct at 2,000 vertically, but color artifacts interfere quite a bit.) 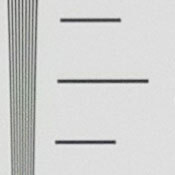 Extinction of the pattern occurred at around 2,450 lines per picture height. Flash: Our manufacturer-specified testing (shown at right) is bright at 13 feet, but the camera raised ISO to 455 to boost exposure. The telephoto test also came out bright at 8.2 feet, though with a considerable ISO boost to 712. Auto flash produced very bright results in our indoor portrait scene, though with very little ambient light at 1/30 second, ISO 350. Most people should be able to hand-hold the camera at that shutter speed without worrying too much about blurring from camera shake especially since the S8100 is equipped with image stabilization, but subject motion could be an issue. ISO: Noise and Detail: Detail is fairly strong at ISO 160 and 200, though blurring becomes visible beginning at ISO 400. Chroma (color) noise is fairly well controlled at all ISOs, though some coloration pixels are present at 1,600 and 3,200. Details are quite fuzzy at both ISO 1,600 and 3,200. See Printed results below for more on how this affects prints. Printed: ISO 160 prints look surprisingly good at 16x20 inches, with good color and detail. ISO 200 images also print well at 16x20, but I prefer the 13x19-inch prints for their slightly better contrast. ISO 400 shots look a little rough at 13x19, both soft and low-contrast, but printing them at 11x14 is better. ISO 800 images are likewise usable at 11x14 inches, but present much better when reduced to 8x10 inches. ISO 1,600 shots are slightly soft, but still quite usable at 8x10. ISO 3,200 images print quite well at 5x7, a very good performance overall. Startup Time: The Nikon S8100 takes about 1.7 seconds to power on and take a shot. That's very good for a long-zoom camera. Shutter Lag: Full autofocus shutter lag is excellent, at 0.18 second at wide-angle and full telephoto. Prefocus shutter lag is 0.071 second, not the fastest out there, but still pretty quick. Cycle Time: Cycle time is also quite good, capturing a frame every 1.4 seconds in single-shot mode. The Coolpix S8100 features full-resolution burst modes with speeds up to 10 frames per second, however we didn't test those modes in the lab. Flash Recycle: The Nikon Coolpix S8100's flash recycles in about 5.5 seconds after a full-power discharge, about average. Low Light AF: The camera's AF system was able to focus down to the 1/4 foot-candle light level without AF assist enabled, though the camera was able to focus below the 1/16 foot-candle light level with the AF assist lamp enabled. USB Transfer Speed: Connected to a computer or printer with USB 2.0, the Nikon Coolpix S8100's download speeds are moderately fast. We measured 4,766 KBytes/sec. Overall, we liked the Nikon Coolpix 8100, and had a lot of fun shooting with it. Outdoors, the Nikon S8100 takes very good photographs with excellent color. Indoors, the camera does reasonably well considering the 12-megapixel resolution and long zoom; and the Nikon S8100 even has HDR modes to deal with difficult lighting situations. The most important feature of the Nikon S8100 is its 10x zoom in a compact frame which is a real bonus for street photographers and vacationers. I liked it and definitely consider the Backlight HDR a real plus. Shutter lag and overall control response is excellent, yet the 4-way VR is not the best stabilization system I've used. Videos are acceptable, if not in the same league as a camcorder; but at least you can zoom optically while recording, for greater versatility. In the end, it's the printed results that matter, making us feel good about recommending the Nikon Coolpix S8100 as a quality contender in the pocket long zoom space, and a Dave's Pick!